The market rally is mimicking a trend that hasn't been seen in more than two decades, according to Avalon Advisors' Bill Stone. 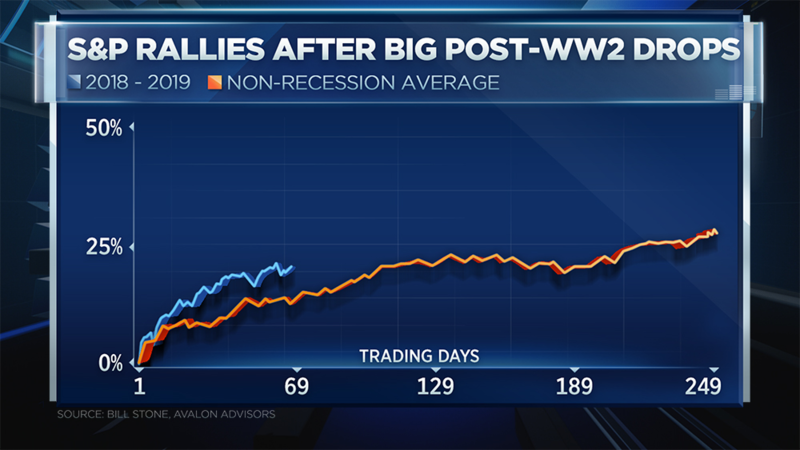 He highlighted the pattern on CNBC's "Trading Nation" in a chart that compares 2018-2019 sharp gains with the average rebound during post-World War II non-recessionary periods. Stone's takeaway: It looks a lot like the dot-com boom based on 65 trading days since the December low. "This rally is second only to that 1998 rally in terms of the strength of it," the firm's chief investment officer said Wednesday. In a note out Monday, Stone wrote "Our analysis of rebounds following large declines since World War II puts this rebound at the high end of the typical at this point." According to Stone, stocks typically rebound 13 percent when a drop isn't connected to a recession. Stone, whose firm has $8.5 billion in assets under management, doesn't believe the rally's power is a harbinger of an eventual dot-com bubble-like demise. He contends the underpinnings of the economy are secure, the Federal Reserve is dovish and a China trade deal will ultimately help multinational companies regain earnings momentum. "Even if it goes back and reverts to a normal rally with no recession, you still have some decent upside left for the rest of the year," Stone said.